Just a few weeks after The Purge 4 title was revealed to be The Island, the first two lead cast members have come aboard for this Purge prequel. Y'lan Noel (Insecure) and Lex Scott Davis (Training Day) are the first actors to officially sign on for the project, although it remains to be seen how many more main characters are still needed for the cast. While it hasn't been confirmed when production will begin, it will certainly have to begin soon, since the prequel is already set to hit theaters next summer. The Tracking Board first broke the news, although there were no details given about the characters they play. 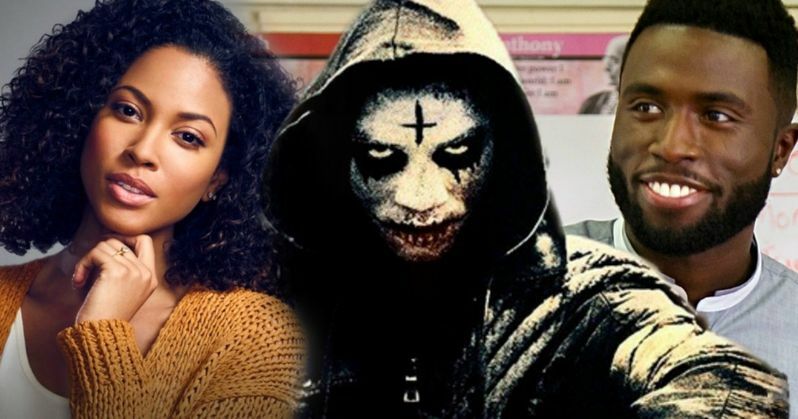 James DeMonaco, who has written and directed all of the Purge movies and is also developing a Purge TV series, revealed in May that this story will take place during the first experimental Purge night, which happened on Staten Island, before this annual tradition went nationwide. The franchise creator James DeMonaco also teased in his May interview that the cast for The Purge: The Island will be 90% black, while teasing how the first Purge came to be, with groups offering large sums of money to poor citizens to stay in Staten Island, with the creator calling it a "monetization of murder" and a "manipulation of society." This time around, though, while James DeMonaco did write the script, he will not be at the helm, handing the reins over to director Gerard McMurray. James DeMonaco added in May that there is a "great twist" regarding how the government, the New Founding Fathers of America, are able to manipulate the entire Purge night. He also added that there is a great anti-hero named William, and while the other films have centered on groups, this movie is "one man's journey," as you see this character redeem himself throughout the film. It isn't clear if William is the role that Y'lan Noel has landed or not quite yet. Universal Pictures announced in February that the Purge 4 release date will be on July 4, 2018, a Wednesday release that puts it between a slew of high-profile releases. It opens just a few days after five new movies arrive on June 29, 2018, STX's I Feel Pretty, Sony's Sicario 2: Soldado, Warner Bros.' Tag, Lionsgate's Uncle Drew and an untitled project from 20th Century Fox and DreamWorks Animation, and two days before Marvel's Ant-Man and the Wasp and Lionsgate's The Spy Who Dumped Me. Jason Blum is producing through his Blumhouse Pictures company, alongside Sebastian K. LeMercier and Platinum Dunes' Michael Bay, Andrew Form and Brad Fuller. The Purge franchise has become one of the most profitable movie series' to date, capitalizing on micro-budget productions that reap big rewards. 2014's The Purge took in $64.4 million domestic and $89.3 million worldwide, from just a $3 million budget, while the 2015 follow-up took in $71.9 million domestically and $111.9 million worldwide from a $9 million budget. Last year's The Purge: Election Year took in $79.2 million domestically and $118.5 million worldwide from a $10 million budget. It remains unclear what the budget figures will be for The Purge: The Island at this time. Y'lan Noel is best known for playing Daniel King in Insecure, with this movie marking his first major studio project. and Lex Scott Davis got her big break by playing recording artist Toni Braxton in the 2016 TV movie biopic Toni Braxton: Unbreak My Heart, which she followed up with by playing Alyse Craig on CBS' Training Day. Is The First Purge Director the Best Choice for a New Blade Movie?